Is South Africa out of the recession? When is the loss of water insured? I have lost my PR certificate – what must I do? The GDP growth projection for the year has been cut from 1.3% to 0.7%. Treasury projects a revenue shortfall of R 50.8 billion in 2017/18. Government is selling Telkom shares to raise cash to save SAA. The consolidated budget deficit for 2017/18 is expected to be 4.3 % GDP, compared with a 2017 Budget estimate of 3.1 %. There is “little space” for tax increases, but some tax increases and spending cuts are planned for the February Budget. Government is looking at providing fee-free higher education and training to poor and middle-income students. A strategic equity partner is being sought for SAA. A new bill on Public Procurement is being prepared. A new board is being installed at Eskom before the end of November this year. A long-delayed Carbon Tax Bill is being sent to Parliament. This MTBPS is a clear acknowledgement of National Treasury’s limitations and starkly lays out the likely path if no dramatic action is taken to address public sector wages, governance at state-owned entities and economic growth in the next six months. Besides a further downgrade by the rating agencies, further risk includes a downgrade of our currency which could result in higher inflation. As already mentioned in our March 2017 newsletter, SARS is going ahead with taxing SA residents working abroad. The new Bill has been signed and will be effective as from 1 March 2019, removing the tax exemption on South African expatriates. This means that any income South Africans earn overseas will become fully taxable in South Africa. The only claimable relief will be for foreign taxes paid. There is often a lengthy delay in receiving the benefit of the foreign tax credit. The main reason for this delay is the arduous requirement of confirming that the foreign tax was indeed paid to the foreign government. Such confirmation is often difficult to obtain. Tax systems vary and some Revenue Services simply, inexplicably, don’t provide any proof. What can SA expats do about It? - An option is to emigrate properly. This will trigger a disposal capital gains tax event (also called an Exit Charge). This exit tax (expatriation tax), treats the taxpayer as if they have sold all assets at fair market value the day before expatriation. For some people, this could result in a mammoth tax bill. - Doing a cost estimate and returning home may be another option. A couple of months ago, Deputy CEO of AfriForum, Ernst Roets, tweeted a shocking statistic. Only 1,7 Million South African citizens (3% of the population) pay 80% of all tax. If those statistics are even halfway accurate, 97% of the South African population do not contribute personal income tax at all. Just a few hundred South African taxpayers have taken advantage of the country’s special voluntary disclosure programme (SVDP) which was due to end on the 31 August 2017. According to reports, the tax amnesty on undeclared foreign assets, which the government had hoped would yield Billions of Rand in additional revenue, has been a flop. To date, the South African Revenue Service (SARS) has handled just 499 applications since the programme was launched on 1 October 2016, amid complaints that the system is unfriendly and expensive. Sources suggest that the SVDP will only bring in a tenth of the nearly ZAR 40 Billion the government had hoped for. The SVDP was launched to allow South Africans to regularise their tax status ahead of the introduction of the CRS. From September, South Africa will start receiving third-party financial data from other tax authorities on a regular basis, which will make it more difficult for people to hide offshore assets. As reported in our last newsletter, the country slipped into a technical recession because of two quarters of negative growth. The second quarter of this year however has shown a positive growth of 2.5% which could signal an upswing in economic activity. Last quarter’s growth was driven by the agricultural sector, followed by improved activity in the mining and financial sector. Does your policy cover damages in the foreign countries that you are travelling in? Some insurance policies cover you almost up to the equator, whilst other policies will only cover neighbouring countries. How long is your trip for? Most insurance policies only cover you for a limited time abroad. Do you have repatriation cover should your vehicle no longer be driveable and needs to be transported back to South Africa? Standard policies will only cover you for such costs in SA. What about medical expenses incurred abroad? Do you have cover should you need emergency accommodation for the driver and passengers? Are your vehicle modifications covered as well? Many 4×4 vehicles undergo substantial upgrades like tents, canopies, spare petrol tanks, extra batteries and tyres etc. which will increase the value of the vehicle. Check if theft of these items is insured. Is your vehicle used for private or commercial purposes? Most policies will only cover personal use. Are you insured if you do not drive on a road, and damages occur whilst driving i.e. on a sand dune? Does the insurer provide support in the event of mechanical or electrical breakdown? Does your policy provide for car hire following an accident or theft of your vehicle? There are a few specialist insurers that are able to provide your required cover. With the ongoing draught in the Western Cape and increased costs for water consumption, the loss of water can be a costly affair when the Rates & Taxes bill from the City arrives in your letterbox. Most insurance policies do provide some form of insurance cover if you have a burst, breaking or leaking water pipe on your property. Such damage needs to be proven to the insurance company and be repaired. Please note that most insurance companies have %-contribution, a formula or a maximum indemnity they will provide for. The costs for the repair of the damaged pipe is normally not insured either. However, should someone forget to turn off a tap which remains undetected for a while, the costs for the loss of such water is not covered by any insurance policy. For our foreign clients that spend only a few months at their residence in South Africa, we recommend that the main water supply be switched off during their absence, should this be practically possible. For further information please contact your consultant in our short-term insurance department. The insurer has reviewed the pricing model and benefits for their commercial and personal policies. To view the summary, please click here for the domestic policy and here for the commercial policy. – Remove any curtains, wooden or plastic blinds and shutters from the windows. Ensure windows and doors are closed. – Move all furniture to the centre of the room, away from windows and doors. Where possible, roll up rugs and loose carpets. – Gather up any flammable items from the exterior of the house and bring them inside (gas bottles, patio furniture, children’s toys, door mats, trash cans, etc.) or place them in your pool. – Fill all baths and sinks with water. – Most importantly, ensure yourself and family including pets are safe and ready to evacuate. Never risk your life in a situation like this and rather evacuate timeously! Here is the new face of Mrs Ayanda Dlodlo, the new minister of the Department. Ayanda Dlodlo who was appointed as the Minister of Communication in the March cabinet reshuffle, now moves to Home Affairs. She is a member of the ANC National Executive Committee and a Member of Parliament, and served as an adviser to President Jacob Zuma from 2009 to 2010. 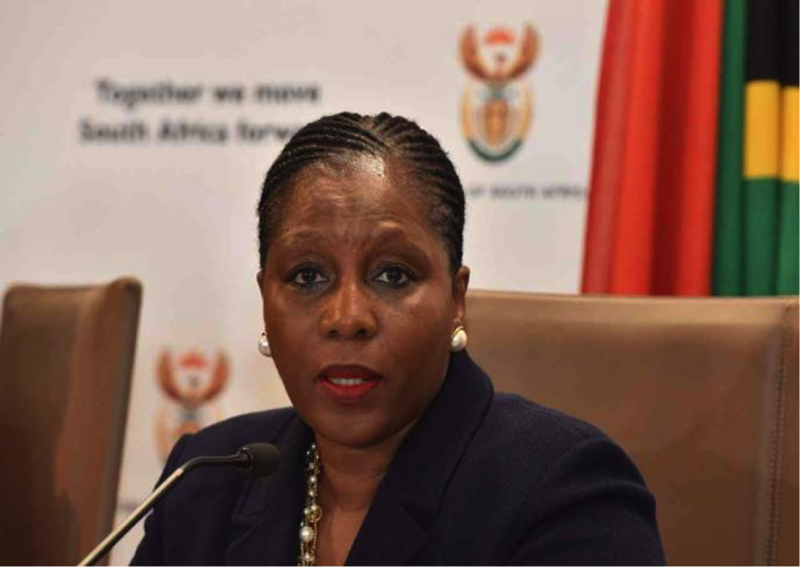 Dlodlo faced criticism during her stint as communications minister, after delays in the appointment of a new SABC board. She and President Jacob Zuma have come under fire with critics suggesting the delay is deliberate and meant to facilitate the appointment of Zuma’s preferred candidates to key positions at the public broadcaster, without the input of board members. The Department of Home Affairs will only ever issue one original permanent residence certificate. In the event that the permanent resident has misplaced the original, a proof of PR application must be done in order to ask for a second form of evidence of their permanent residence status. An application needs to be lodged via Visa Facilitation Services (VFS) who maintains offices in all major South African cities. There is an online registration system available and payment of the application fee is required, before an appointment can be confirmed. Your passport, copies of the old PR certificate and your SA ID book (where available) should at a minimum be submitted. The more information and evidence included with this application, the better. The estimated processing time for this type of application is between 6 and 12 months. should you require further assistance. – Long-term residence visas will be introduced and will be fast-tracked for applications with critical skills, investments or business interests and this visa will be granted to the entire family. This family-oriented visa will allow family members such as spouses and children to work and study in the country without the need to apply for separate visas. – International students will be granted residence visas if the students are studying in critical skills areas. Those who are studying towards the occupations that are needed in the country and intend to progress into critical-skills-occupations and once qualified, will be retained to support the local economy and transfer theirs acquired skills locally. – Refugees only qualify for long term visa once they have lived 10 years in the country and must apply to the Standing Committee for Refugee Affairs (SCRA) for certification to be declared a refugee indefinitely. Further considerations are made, among them the continuation of the non-encampment policy, however the automatic right to work and study will be removed, but in exceptional circumstances this right will be granted to asylum seekers. – Visa-free movement on the continent for all African citizens for up to 90-day visits. Currently, only 20% of all African countries offer visa-free travels to citizens of the continent. An introduction of special visas for SADC citizens is to be implemented including work, traders and SME visas. Quotas are considered for this to be established. – Training and transfer of skills: with the recruitment of international migrants it must be ensured that a direct or indirect skills transfer is taking place. If a direct skills transfer is not possible, a special training scheme must be implemented and funds needs to be established to help train locals. – Changes in the Emigration Policy: Mandatory registration of SA citizens who want to emigrate for longer than 3 months (except for tourism purposes) to better understand the spread and profile of expatriates globally. It is also stated that career development and work or exchange programmes for young people should be supported and induction programmes for returning expatriates should be embraced. A continuation of dual citizenship is also mentioned. The White Paper, which was published in July this year, is also part of the National Development Plan and its Vision for 2030. It is estimated that it will take 2 years until changes will be implemented. We recommend that all applicants that qualify for a permanent residence permit to lodge an application before the proposed amendments become law. The Department of Home Affairs has just released information regarding Police Clearance Certificates and the way forward in respect of procurement of Police Clearance Certificates which are required for visas lodged from within South Africa, as well as extensions or variation or change of conditions of an existing Visa or permanent residence permits. Up until now the process has consisted of visiting the nearest Police Station for payment of the administrative fee and also for taking of fingerprints. The prints are then dispatched to the South African Criminal Records Bureau for processing and within a reasonable turnaround time this process can be completed. With effect from the 1st January 2018, the process will change and “biometric background check services” will be available at the point of lodgement of the visa extension or other visa application through the offices of VFS. The system will ostensibly be linked to the South African Police Service database. According to the VFS website the service will be provided at a value added cost of R 175.00 including VAT payable to the SA Police services. Although the system kicks in fully on the 1st January 2018, with effect from the 1st November 2017 an applicant will have the option to either go the route of current practice or to apply through VFS. It is extremely important to note that the VFS Police Clearance referred to above is only in respect of applications lodged at VFS for temporary and permanent residence visas. In respect of all other requirements for a South African Police Clearance Certificate that fall outside the above categories, the hard copy applications done through the South African Police Services still remain unchanged. Up until the 31st December 2017 manual copies of Police Clearance certificates will be taken in, but from the 1st January 2018 only the VFS submitted documents will be accepted. The average weighted premium increase is 7.9 %, most plans range from 7.3% to 8.3%. Introduction of the day-to-day extender benefit if you run out of savings. The Smart Plan over-the-counter medicine benefit has now the self-medication benefit at Clicks or Dischem. The Chronic Illness Benefit has now the premier plus and GP network for HIV-infected people or such with Diabetes. All co-payments, deductibles have been increased in line with the premium increase of the underlying plans. The limits for chronic illness, MRI / CAT scans and the oncology benefit remain unchanged. There is the new Young Families Benefit: Other cost in connection with pregnancy and childbirth (scans, breast pumps etc.) are paid from the hospital benefit. This also includes paediatrician visits, nutrition assessments etc. Two new apps have been introduced: My Pregnancy and the My Baby app. The Doctor Connect App has been launched. This will give access to over 105’000 doctors worldwide for questions. Video consultations are possible too. There are surprise rewards for active goal members. The Device Booster and Bike Booster benefit are introduced. There is an activation fee payable and discounts are up to 75% on devices and 25% off bikes. Members need to activate Vitality Move to win more rewards at no cost. However, one needs to apply for another card that needs to be swiped before purchases. Please note that the deadline for plan changes is the 15th December 2017. A new traffic law is on the way to be signed by the South African president. As the Road Traffic Offences Amendment Bill (AARTO Bill 2017) has been passed by the National Assembly on 5 September 2017, the demerit point system will be implemented all over South Africa in due course. Even if this change in the traffic laws might still take some months, you should, nevertheless, be aware of the changes that will be implemented soon. The new South Africa traffic laws will implement a demerit point system similar to those used in many other countries such as the UK or Australia. - Exceeding the speed limit of more than 15kmh and fines of R500 or more will incur points. It is possible to receive multiple points for one incident, i.e. 2 points (R 750 fine) for driving 81-85kmh in a 60kmh zone while holding a cellphone (1 point and R500 fine) would accrue a total of 3 points and R 1250 fine for this one incident. – The maximum limit is 12 demerit points. If this is exceeded then a suspension will take place for three months and any suspension will be extended for further three months per point above this limit. – Points also will be reduced every three months, so one point will be deducted every three months, if no further traffic infringement occurs. – For the third suspension, the licence will be cancelled and destroyed and new licence has to be applied for and redone again. – Demerit points will be allocated to the vehicle owner and need to be transferred/reallocated should the owner not be the driver in respect to the fine – a reallocation has to be effected by the vehicle owner. The time limit to request a reallocation and transfer of points to the specific driver has to be effected within 32 days. Further, in future, grievances of drivers will no longer be heard by the Courts, but by an Appeals Tribunal – for a still to be defined application fee. Appeal decisions, however, can still be taken up to the High Court should the appeals hearing not have the desired outcome. We are very excited to welcome Mr Frank Lohe to our short-term insurance team. Mr Lohe is originally from Germany and resident in Cape Town for many years. His career background is insurance and customer service, which suits his new job ideally. He will be trained to become a short-term insurance consultant and we wish him lots of success and satisfaction at SwissSure. Please note that we are open on normal work days Monday – Thursdays from 08.30 to 16.30, Fridays 08.30 – 16.00. Our offices will be closed from the 22nd December 2017 from 12.00 until the 2nd January 2018. We re-open from 3rd January 2018.